I was not aware of any congregational versions of the psalm, so I made it my goal to come out of the weekend with a version that could be used by congregations. 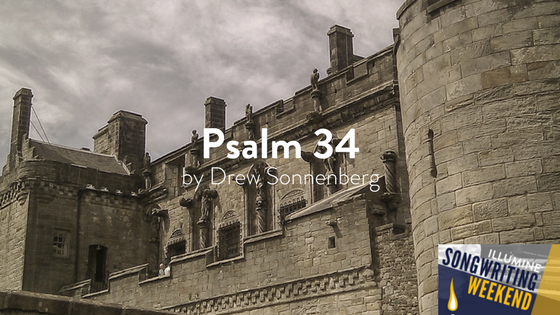 Psalm 34 was written by David when he was in the midst of making several mistakes. First, even though he was God’s anointed king, he was running for fear of his life from Saul. Secondly, he went to the enemies of the Israelites for shelter and soon realized that was a bad idea, so pretended to be insane so they wouldn’t kill him. The solution to both of these mistakes was the same, as David soon realized. God was his shelter, his protector, his deliverer. He need only put his trust in God, who would hear and answer him. The verses reflect the various mistakes that both David and we make throughout our lives, as well as the realization of our mistakes. The chorus is a thankful acknowledgment of God’s continued patience, grace, and protection for his people, as well as a plea for him to help us stay faithful. While the rhythm is not impossible for a congregation to read, they would greatly benefit from being able to hear it once before being asked to join in singing. Perhaps go through the chorus and a verse using a lead instrument or vocalist to help them learn the melody. There are some sizeable gaps between the lines of the verses. These would be best filled by some sort of lead instrument such as a violin, flute, or trumpet (perhaps I’ll even write out a part in the future). The themes of this song work well when emphasizing God as our protector, our loving Father, or the hearer of prayers.